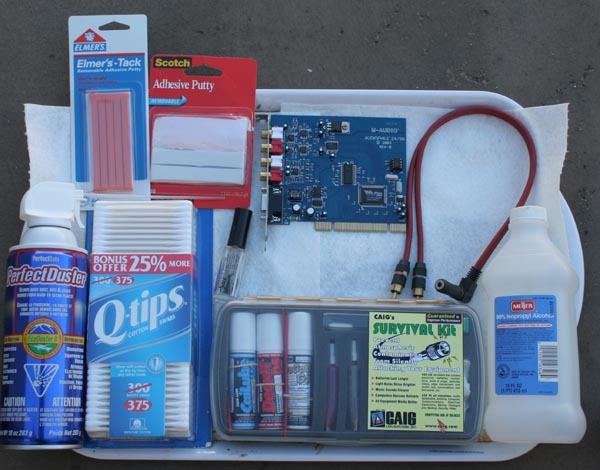 Below: a basic "toolkit" of products and components used in this mod. 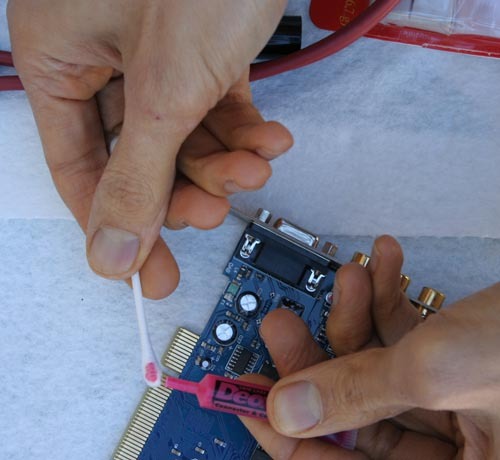 Below: Clean the contact strip with 99% isopropyl, first; then use the CAIG Audio Survival Kit to further clean, enhance and protect all contact-mating metal surfaces. 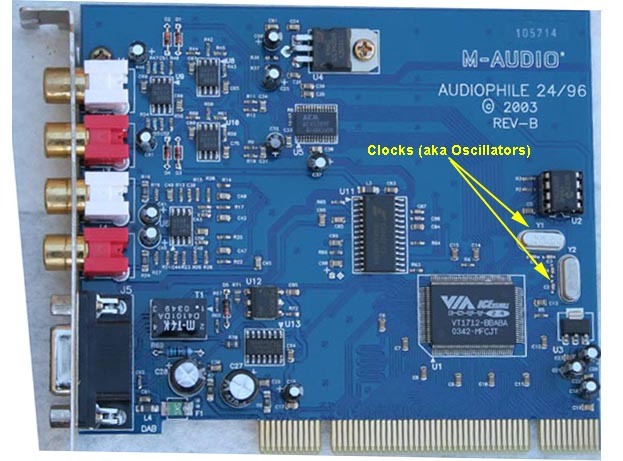 Below: Cover the clock (oscillator) -- however many are found on your audio card -- with adhesive putty/tack or rope caulk. End of PC audio card contact-enhancing and clock-damping mod. Below: In a future mod, I'll begin replacing non-SMD components on the circuit board with ones of higher quality. 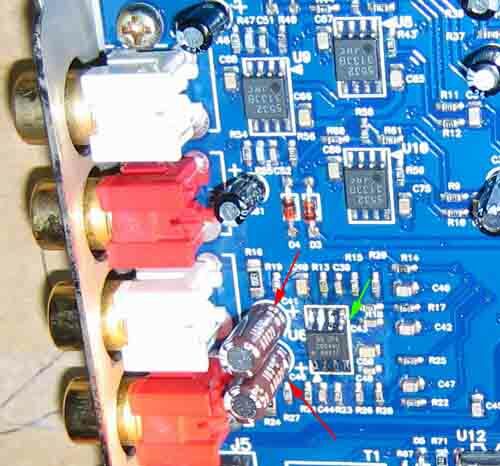 For example, op-amps (green arrows) and capacitors (red arrows). 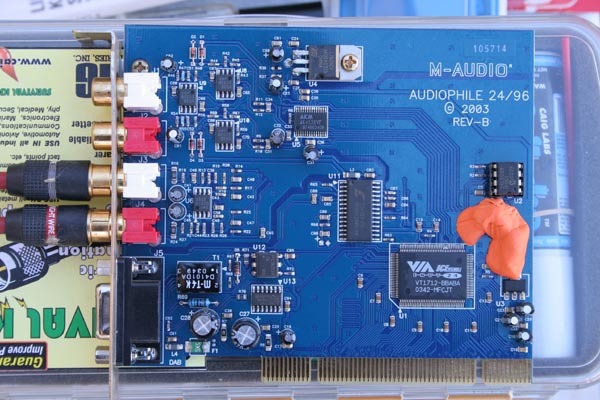 Sorry -- there should be a green arrow (not red) pointing to the two-channel audio op-amp (center left). Below: (2006-12-16). I followed through on part of the promise, made above, and tweaked the 2-channel (Left and Right) analog outputs. Specifically, I replaced the stock NJR JRC 5532 op-amp (green arrow) with a Texas Instruments OPA2604 model. I also replaced the stock capacitors (red arrows) with higher-quality (but same value) units made by Nichicon. I added the op-amp first, did a listening test, then added the new caps, and did another listening test. Both yielded subtle -- read: not huge -- improvements in audio fidelity.